A geospatial term that originated in Canada due to the similarity in origin with both official languages (English and French). It encompasses various tools and techniques from a multitude of geographic disciplines (geographic information systems (GIS), remote sensing, cartography, global navigation satellite systems (GNSS), photogrammetry, geography, surveying, and other related forms of spatial mapping). Cartography is the practice of creating maps or visual representations of geographic areas. Traditionally maps have always been created on paper, but since the wide spread use of geographic information systems (GIS), maps have evolved more into digital formats. GIS, an essential tool for urban and resource planning, allows people to solve and model real world situations by incorporating spatial and tabular data, and has become an essential cartographic tool. Remote sensing is the process of acquiring information about an object without making any actual physical contact with it. Remote sensing is vital to numerous fields, including geography, surveying and most Earth Science related disciplines. LiDAR, a specialized remote sensing technique uses high precision GPS with an inertial measurement unit (IMU) to determine accurate location. The resultant measurements consist of geographic locations that can be further processed to produce many different spatial data products. 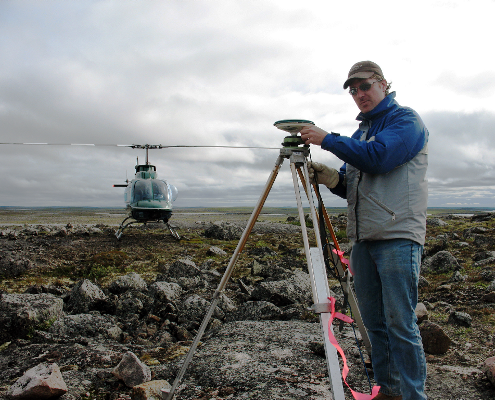 Surveying uses techniques of determining terrestrial positions of points on the Earth’s surface, and the distances and angles between them, to establish maps and boundaries. A global positioning system (GPS) is a highly accurate navigation system that uses satellites and established control points to determine accurate locations. The surveying and mapping community was one of the first to take advantage of GPS technology to it dramatically increase productivity, resulting in more accurate and reliable data. 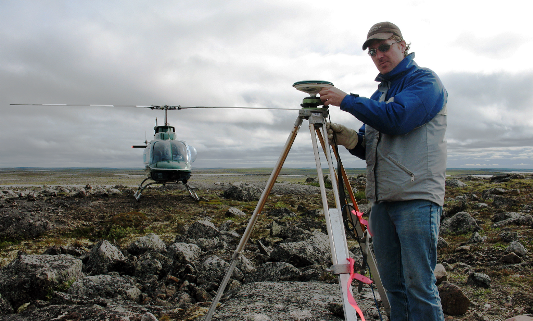 My name is Ted MacKinnon, I am a geomatics specialist with over 20 years experience currently working with Natural Resources Canada in Atlantic Canada. I have earned the GISP status from the GIS Certification Institute, a certified Remote Sensing Specialist certificate from the Canadian Institute of Geomatics, am a Fellow with the Royal Canadian Geographical Society, have been published in several journals and magazines, and am very active with several professional association Board of Directors. I originally started an online portfolio as a way to have my resume online all the time, and to help progress my career while studying Applied Geomatics Research at COGS but since then I have allowed it to morph into an online geospatial web resource where I share knowledge about geographic information and geospatial resources (through my experience, literature, samples, maps, photos and other interesting information that I have learned over the years). I have been fortunate enough over my career to work in many geomatics related disciplines in academic research, private industry, and all levels of government, providing me with many different views and experiences of the geomatics sector. Part of that time provided with a unique opportunity that allowed me to travel all across North and Central America for various survey projects, allowing me to better appreciate Canadian geography. The majority of people can not really appreciate how big Canada really is, and how different its landscapes are from coast to coast. Living in a rural Canadian environment, although great for enjoying an easy going laid back lifestyle, can sometimes have drawbacks, such as staying informed on what is currently happening with the Canadian geomatics sector. However thanks to the evolution of the technology, the internet, social media and extensive networking through professional associations, I have not only been able to stay current, but also become a major influencer in the Canadian geospatial community. My site allows others to learn a little more about myself, my work and my passion for geomatics. Therefore I encourage people to browse the various geospatial related content on my site and connect with me on the social media. Together we make the geospatial community stronger. After checking out the sites in and around Managua, we ventured off to some of the recommended areas outside of the city since we still had amble time left before our equipment would be released. South of the City of Managua is the Parque Nacional Volcan Masaya, the countries largest Masaya sulfur dioxide gasNational Park and one of several protected areas of Nicaragua. I found this neat T Shirt while walking around one of the local markets in Managua and couldn't resist getting it (especially since it was only $5). This image is an Aspect Model that I derived from a digital elevation model (DEM) of Lismore, Nova Scotia. The aspect values of the slopes of the DEM are represented in the model by a 0-255 grey scale color ramp. Click here to learn a little more about Aspect Models and how the image below was created. Poster showing GPS data from Jeremys Bay Campground Kejimkujik National Park and Historic Site, created with ArcMap 9 from data we collected with a Leica RTK GPS & Total Station. After checking in the city of Granada we went on an ecological tourism side of things by going on a guided boat tour of the Archipielago las Isleta, on Lake Nicaragua, a few minutes south of Granada. Our young tour guide promised us that on the tour we would see where some of the richest in the country live, see some historic forts and buildings and perhaps see some wild life and nature. Very exciting to some I sure but more so just a nice change from the typical colonial like sights and was also much cooler on the lake then it was in the city - witch was a nice change.